Honduras has always been an American plaything, to be toyed with for the benefit of United Fruit (rebranded Chiquita) and the native landowning aristocracy, and disciplined when necessary: Washington sent in the Marines a total of seven times between 1903 and 1925. The Honduran peasants didn’t like their lands being confiscated by the government and turned over to foreign-owned producers, who were granted monopolistic franchises by corrupt public officials. Periodic rural revolts started spreading to the cities, despite harsh repression, and the country – ruled directly by the military since 1955 – returned to a civilian regime in 1981. Yet the military influence, far from receding, manifested its power ever more aggressively, engaging in forcible conscription of young villagers, and targeting left-wing opponents and trade unionists with violent repression. Throughout the Reagan years, Honduras was used as a convenient base for the Nicaraguan “contras,” a military formation organized by the CIA to overthrow the Sandinista government. American aid poured into the Honduran military, whose officers were trained by the US. The real rulers of the country were the Honduran officers’ corps: the elected “President” and the national legislature were just window dressing. Real change didn’t occur until 2006, when Jose Manuel Zelaya Rosales, a moderate conservative and head of the Honduran Council for Private Enterprise, was elected President. Hardly a left-wing radical, he nevertheless instituted a number of reforms, especially in the realm of public education and direct aid to the destitute, that provoked outrage from the right. The final straw was Zelaya’s attempt to shift power away from the military and strengthen the presidency: he launched a campaign to change the Constitution in order to allow him to serve a second term. Such a direct challenge to the military was unprecedented, and impermissible: at dawn one day President Zelaya found himself being bundled into a helicopter still clad in his pajamas and, a few hours later, out of the country. The earliest returns had Nasralla ahead by five points, but after the initial announcement by the Electoral Commission, controlled by National Party candidate Juan Hernandez, the counting process abruptly halted: the reason given was “technical problems.” Yet there is no conceivable technical explanation for the delay in announcing the totals since all the results were electronically transmitted from local voting stations as the polls closed. After a long and unexplained silence, the authorities announced more returns: it was now neck and neck, with Hernandez eventually pulling ahead. All in all, as democracies go Honduras is the archetypal banana republic: yes, it was the inspiration behind O’Henry’s coining of that phrase. So far, the US has done nothing but mouth pious platitudes about peaceful reconciliation and respect for democracy, but this hardly addresses the wholesale fraud the Hernandez regime is trying to pull off. They got away with it under the Obama administration, with Hillary Clinton’s State Department legitimizing the 2009 elections, which were marked by violence, intimidation, and brazen fraud. Now Hernandez – who is doing what Zelaya wanted to do, and that is run for a second term – is testing Washington to see if the policy of enabling petty tyrants and obsequious satraps is still in effect. This New Yorker piece – which, you’ll note, nowhere mentions the key role played by Hillary Clinton in Zelaya’s undoing – reports that Gen. John Kelly, Trump’s chief of staff and “keeper,” is very pro-Hernandez, supposedly on the grounds that he’s reduced the crime rate and kept a lid on the influx of Honduran refugees. Yet Honduras still has one of the highest crime rates in the world and the government is rife with corruption. US foreign policy is more continuity than change, even under the Trump administration, which promised to turn our geopolitical and diplomatic priorities upside down. That’s why I don’t expect any real turnaround in our Honduras policy. Yet perhaps the fact that Nasralla is a populist, and a former talk-show host, who has never held elective office, will cause the Trump team to look on him with some sympathy. And I would add that there’s a certain political advantage in taking on the Honduran military clique and their front man: this is another bad outcome that Trump can trace back to the previous administration, and specifically back to Mrs. Clinton. A SPECIAL NOTE: Yes, our fundraising campaign is still going, and we still need your help to keep this web site going. Because it just doesn’t appear like magic every day: a robot doesn’t automatically update the news and views you need to understand what’s going on in our world. A small staff of intrepid editors, writers, and administrative personnel is working 24/7 to track the course of history as it unfolds. We aren’t unbiased, yet we stick to the facts. I don’t think there’s a web site like this anywhere on the internet – a news and opinion site narrowly focused on foreign policy that is entirely supported by its readers. 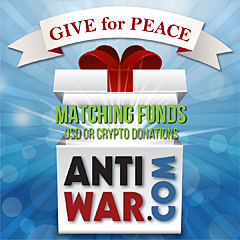 We depend on you, our dedicated readers and supporters, to give us the resources we need to fight the War Party and mobilize the American people for peace. This means educating ordinary citizens about what their government is doing abroad, in their name and at their expense. But we can’t do it without your support. Please make your tax-deductible donation today.